A year ago I was asked by Culture Liverpool if I was interested in directing a weekend of celebrations to mark the 175th anniversary of the first Transatlantic passenger crossing from Europe to Halifax, Boston and New York. On 4th July 1840 a small steamship left Liverpool and for decades this two way traffic had an influence on our lives and culture. I had a lot to live up to, Culture Liverpool had delivered some massively impactful summer events including The Giants and Liverpool as a city has become a much more confident, outward looking and strident place these last few years. Nevertheless I jumped at the chance to investigate and celebrate the creative culture clash between Britain's home-grown music, fashion, art, design, and film and those that trickled over from across the pond. The first thing to do when embarking on a project like this is to build a team to augment the skills we have at HemingwayDesign. Liverpool is blessed with a lively and talented events team in Culture Liverpool and by bringing in Deco Publique (who produce our Vintage by The Sea Festival) we had the bedrock to deliver something of scale. In the initial research and ideas generation phase it wasn’t difficult to unearth all those stories about The Cunard Yanks and how the Beatles took US black music and gave it their own twist. It became clear how architectural thinking and art flowed across the Atlantic along with the diversity of religion and cultures. It was easy to plan the music elements of the weekend and to work out how to send off The Queen Mary 2 on her historic journey to New York on the evening of American Independence Day. But what was to be the big idea? What could be our Giants moment? I kept going back to what Liverpool meant to me. As a teenager Liverpool club culture drew us from wider Lancashire. Eric’s was an amazing punk and new wave club where the ambiance was much more arty and eclectic than Manchester’s Russel Club or Band on The Wall. The soul and funk clubs (as documented by our music curator on T175, Greg Wilson) were brilliant and with a level of fashion that was akin to what I imagined New York’s Studio 54 to be like. The cities clubs seemed to have a level of “dressing up” that was off the scale. Years later when we had one of our early Red or Dead shops in Liverpool, it became known as one of our stores where the more daring elements of our collections would get the best uptake. So I suggested to put on a public/community catwalk show for the whole of Liverpool to show the world how this city loved to dress up and strut its stuff and to show Britain how Liverpool is a city with a real sense of community and togetherness and with a populace that is outgoing! This was to be for everyone from dance troops to twins, from pensioners to bridal parties, from couture to camp. I flippantly said lets beat the “Guinness World Record for the most folk on the catwalk” . Lauren from Deco Publique got out her smartphone and found that the record was held by the Instituto de Estudios Superiores de Moda, Casa de Francia (Mexico) in Mexico City, Mexico, where they got 3083 on November 24th 2013. The record was there for the taking from them there Mexicans, but this had to compete with The Giants for spectacle and professionalism, it couldn’t and shouldn’t be just be a few thousand people walking down a catwalk. So we set about assembling a team that could bring international catwalk standards to a giant catwalk on Liverpool’s stunning waterfront, a show to grace those Three Graces. We brought in ex Clothes Show supremo Jane Galpin to head up the catwalk and she was truly magnificent. She in turn assembled a wonderfully experienced team of, choreographers, dressers, show callers, hair and beauty teams. Greg Wilson and his trusty sidekick Derek were magnificent with the music and the visuals by Light Design UK were stunning. And then the Culture Liverpool sponsorship team engaged Very.co.uk. This was a masterstroke, a massive locally based fashion retailer (with 3500 people employed in the city) whose sponsorship allowed us to have great production values and give us a chance of holding the crowd for the 3 hours plus it would take to get the “models” down the runway in style. We pulled it off and we really did it in style. We smashed it and 3651 beautiful people of all ages, size, shape and background smiled, danced, cartwheeled and even kung-fued down the catwalk record. Liverpool really did show what a happy, outgoing and diverse community it has. It was a humbling and moving experience with hundreds of spectators deciding that they wanted to join in with the community groups who had practiced for months. Some of those that decided to join in were very old, some very young, some blind, some disabled. And all this was just one section of the Transatlantic 175 weekend to which 250,000 well behaved people turned up. Our Eat the Atlantic food festival featuring Cake City (an edible map and series of 3D edible iconic buildings from Liverpool and New York) and curated by Simon Preston was a roaring success as were the classic car displays and Classic Car Cavalcade curated by Dominic Santana. And then there was Vintage on The Dock hosted by The Albert Dock. On a balmy summers evening, Greg Wilson played a super (shortened due to the success of the audience participation in the catwalk) set of disco that evoked that special relationship between Liverpool and New York, followed by some pomp and circumstance by the Band of the Royal Marines Scotland who gave us a tailored set from Gershwin to Rule Britannia. When the beautiful big lady sounded her ships horn and the thousand of passengers assembled on the decks of the QE2 joined in with the thousands on the Pier Head singing New York, New York the tears flowed. The media coverage and reach has been amazing (well done media team)...with a Twitter reach of 1.9 billion prior to being on The One Show. 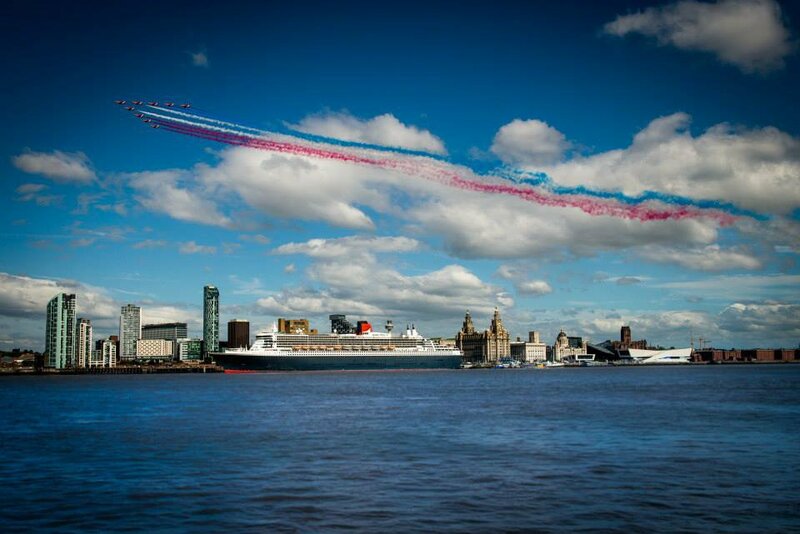 We are immensely proud of what took place on the weekend of the 4th and 5th July 2015 on the waterfront of Liverpool. 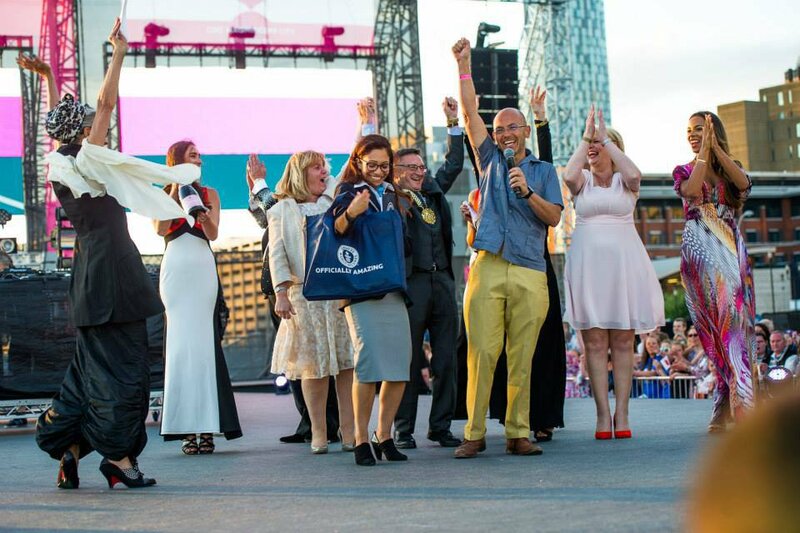 We are eternally grateful to Liverpool Council for giving us the chance to do this, the hundreds of people involved in organising the event, the sponsors and of course all who got up on the enormous catwalk and made those 4 hours so moving and unforgettable. This really has been a highlight of my career.